First of all I enjoy reading your articles. Now, I have a problem with my gasoline Onan generator. My generator surges during idle. The voltage checks out at 110-115 volts AC during idle or load. I've cleaned the carburetor, replaced the fuel filter, and replaced both spark plugs, all to no avail. Can you please help me with the carburetor and governor adjustments? It’s an Onan 4000-watt Genset. Well Michael, it certainly sounds like the governor is out of adjustment; basically hunting around for the proper frequency. At no-load (idle), the frequency should measure around 62 or 63-hertz. Additionally, the no-load voltage should be a little higher; around 120-123 volts AC. Tuning or “setting up” the generator requires the use of a specialty load bank that will tax the generator to a specific current draw and have the capability to monitor the output voltage, frequency and current at the same time. They can’t be tuned by ear. On your particular generator there are three separate carburetor adjustments and three governor adjustments and they must monitored and adjusted simultaneously. The load bank is the preferred method. In fact it’s my opinion that using a load bank is the only method. Not all RV service techs, let alone RVers, realize that every mechanical action performed on the carburetor and governor will have a direct electrical response. Therefore, the only way to adjust the RV generator (properly) is to make such adjustments while monitoring the output voltage and the electrical frequency, while applying a known load in incremental steps. Oh, it can be done from a “ballpark” perspective, but you’d just be guessing and running the risk of harming a myriad of 120-volt AC loads in the coach. Unfortunately, the generator set-up procedures are too in-depth to fit within the confines of this column, but I do have a possible solution in the form of a training video I developed for professional RV service technicians. If you would be interested in knowing exactly what takes place during a professional generator set-up, “RV Generator Tune-Up/Set-Up Procedures” will show you each step in the process. Send a self-addressed, stamped, long envelope to the column and I’d be happy to send you an order form. 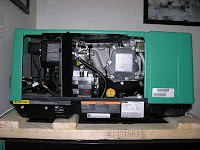 If not, I would recommend you find a properly equipped RV generator shop for those finite tweakings that are necessary. Call first to be sure they indeed have a load bank.